Vancouver, BC – Skyharbour Resources Ltd. (TSX-V: SYH) (OTCQB: SYHBF) (Frankfurt: SC1P) (the “Company”) is pleased to announce plans for its upcoming summer 2017 drill program at its flagship 35,705 hectare Moore Uranium Project, located approx. 15 kilometres east of Denison Mine’s Wheeler River project and near regional infrastructure on the southeast side of the Athabasca Basin, Saskatchewan. The Company is planning a 2,500 metre diamond drill program commencing in August to follow up on the success of the recently completed winter 2017 drill program with planned drill targets located on the Maverick Corridor as well as other regional targets planned for drill testing. The Company is also carrying out a comprehensive data compilation program at Moore to aggregate all of the historical and ongoing exploration results and plans to use new and innovative techniques to analyze this data to enhance the discovery potential and resource delineation at the project going forward. Given the success of Skyharbour’s first phase of drilling at the Moore Project in the winter of 2017, the Company has planned for a 2,500 metre summer drill program to commence in August. Drill targets will include several regional targets at the property as well as the Maverick corridor where previous drilling has intersected high grade uranium mineralization at the Main Maverick Zone including 6.0% U3O8 over 5.9 metres at 265 metres depth in hole ML-199, as well as the discovery of new, high grade mineralized lenses along strike from this Main Maverick Zone. The Maverick corridor is over 4 kilometres long yet only 1.5 kilometres have been systematically drilled with most of this drilling and known high grade uranium hosted at or near the unconformity leaving strong discovery potential along strike but also at depth in the basement rocks. The Company has received the necessary permits and is fully funded for this upcoming drill program with over $3.7 million in the treasury. Additional news is forthcoming on the drill program. Skyharbour is carrying out an extensive data compilation program on its Moore Uranium Project to aggregate all of the historical and ongoing exploration results and geological information. Over $35 million in historical exploration has been carried out over several decades including airborne and ground electromagnetic and magnetic surveys, ground gravity, seismic, IP/resistivity and geochemical surveys, mapping, prospecting, lake sediment sampling programs and the drilling of more than 380 diamond drill holes. The Company is compiling all of this data into a comprehensive, modern, user-friendly proprietary database that will help streamline geological analysis and target evaluation for future exploration programs. Reinterpretation of historical data led to the new discovery of a high grade uranium lens at the Maverick East Zone in the 2017 winter drill program which included 4.17% U3O8 over 4.5m in hole ML-202. Skyharbour will utilize new techniques and innovative analysis with the database to enhance the discovery potential at Moore going forward. Skyharbour recently reported results from its 5,450 metre, 15 drill hole, winter 2017 diamond drilling program at its Moore Uranium Project (see May 23rd, 2017 news release). Multiple drill holes intersected high grade uranium mineralization at the 4 kilometre long Maverick structural corridor. Previously reported high grade results included 20.8% U3O8 over 1.5 metres within an interval returning 6.0% U3O8 over 5.9 metres in hole ML-199; 9.12% U3O8 over 1.4 metres within an interval returning 4.17% U3O8 over 4.5 metres in hole ML-202; 5.29% U3O8 over 2.5 metres within an interval returning 2.99% U3O8 over 5.0 metres in hole ML-200; and 2.25% U3O8 over 3.0 metres in hole ML-208. This high grade mineralization within the Maverick corridor is relatively shallow ranging from 250 metres to 275 metres vertical depth. Also of note is that hole ML-202 represents the discovery of a new high grade mineralized lens on the corridor. Only 1.5 kilometres of the total 4 kilometre long Maverick corridor have been systematically drill tested leaving robust discovery potential along strike as well as at depth in the underlying basement rocks which have seen limited drill testing historically. Skyharbour holds an extensive portfolio of uranium and thorium exploration projects in Canada’s Athabasca Basin and is well positioned to benefit from improving uranium market fundamentals with five drill-ready projects. In July 2016, Skyharbour acquired an option from Denison Mines, a large strategic shareholder of the Company, to acquire 100% of the Moore Uranium Project which is located approx. 15 kilometres east of Denison’s Wheeler River project and 39 kilometres south of Cameco’s McArthur River uranium mine. Moore is an advanced stage uranium exploration property with high grade uranium mineralization at the Maverick Zone with drill results returning 6.0% U3O8 over 5.9 metres including 20.8% U3O8 over 1.5 metres at a vertical depth of 265 metres. 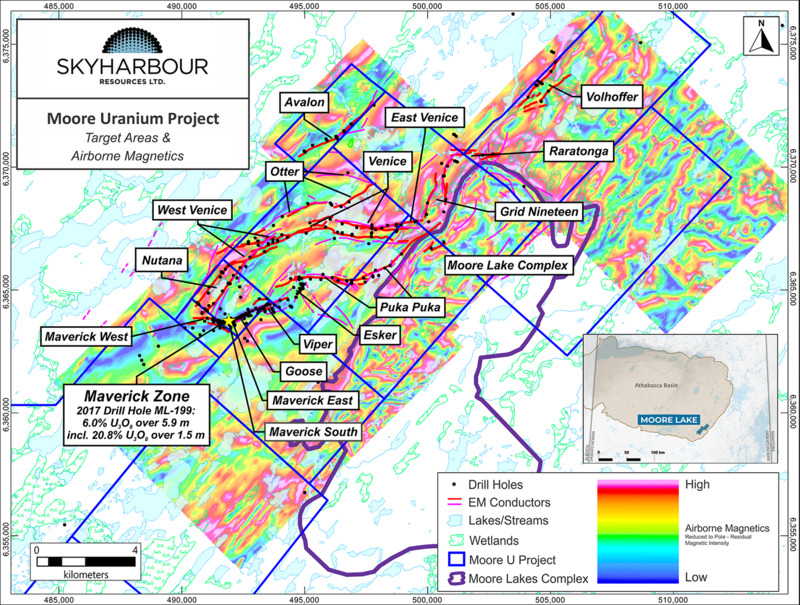 Skyharbour recently signed option agreements with AREVA Resources Canada and Azincourt Uranium whereby AREVA and Azincourt can earn in 70% on the Preston Project through a combined $9,800,000 in total exploration expenditures, as well as $1,700,000 in total cash payments and 4,500,000 Azincourt shares. Preston is a large, geologically prospective property proximal to Fission Uranium’s Triple R deposit as well as NexGen Energy’s Arrow deposit. The Company also owns a 100% interest in the Falcon Point Uranium Project on the eastern perimeter of the Basin which contains an NI 43-101 inferred resource totaling 7.0 million pounds of U3O8 at 0.03% and 5.3 million pounds of ThO2 at 0.023%. The project also hosts a high grade surface showing with up to 68% U3O8 in grab samples from a massive pitchblende vein, the source of which has yet to be discovered. 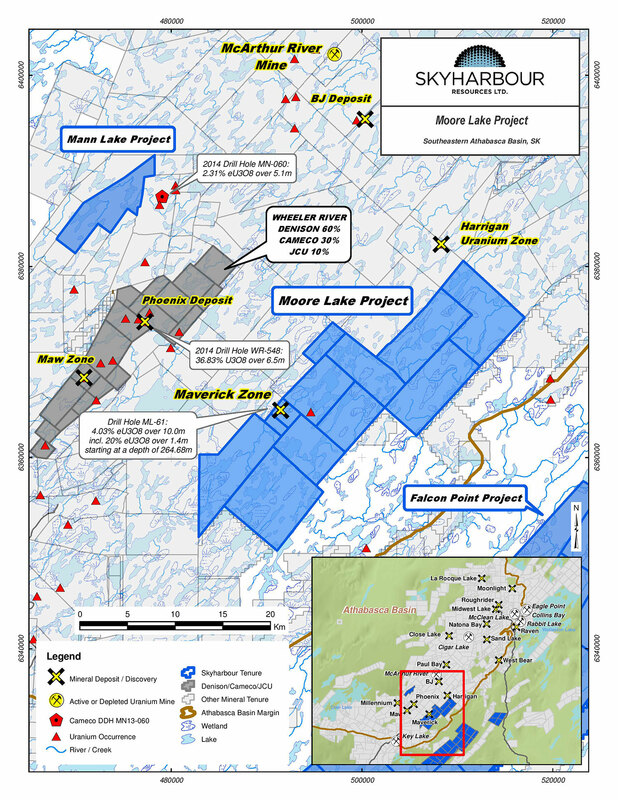 The Company’s 100% owned Mann Lake Uranium project on the east side of the Basin is strategically located adjacent to the Mann Lake Joint Venture operated by Cameco, where high grade uranium mineralization was recently discovered. Skyharbour’s goal is to maximize shareholder value through new mineral discoveries, committed long-term partnerships, and the advancement of exploration projects in geopolitically favourable jurisdictions.